Pre-heat oven to 350° F. Using a food processor finely chop the hazelnuts and toast them in a dry skillet for a few minutes until fragrant and light brown in color. Set aside. 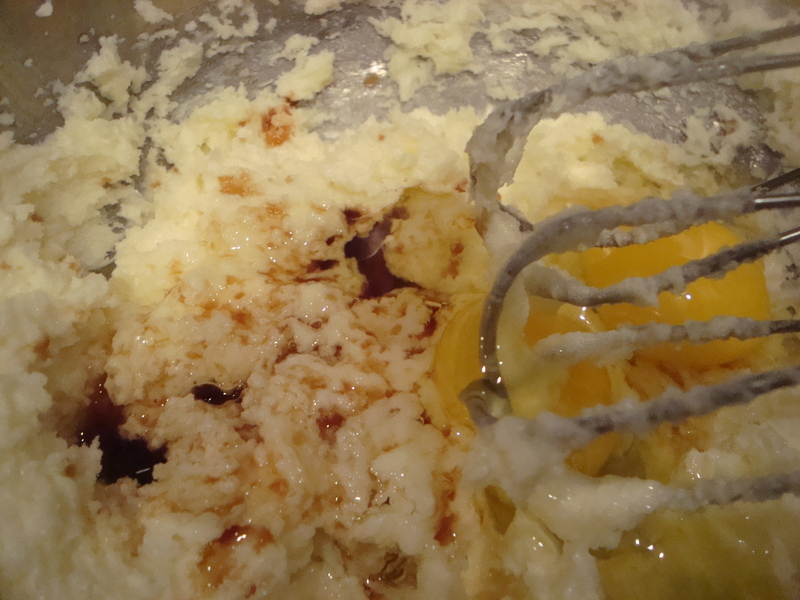 In a mixing bowl cream together butter and sugar then add vanilla and eggs until nice and smooth. 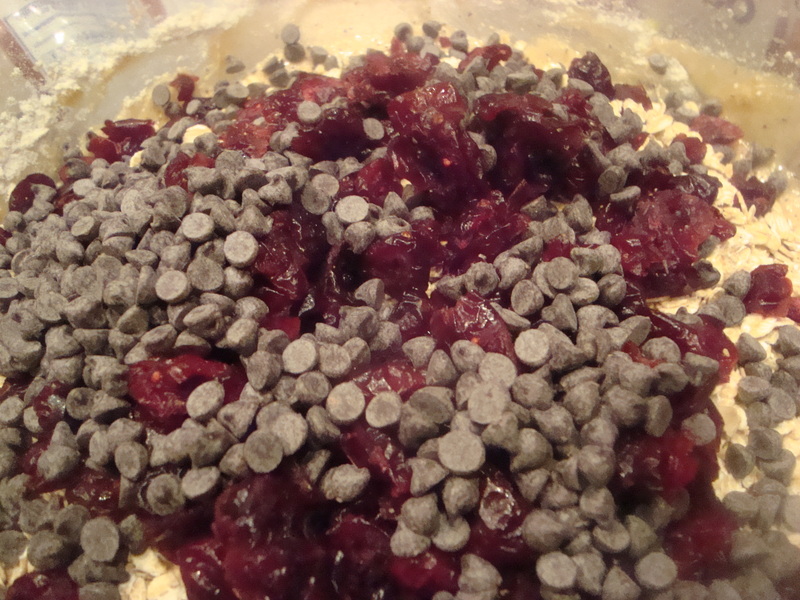 Slowly add in baking powder and flour mixture until well incorporated. 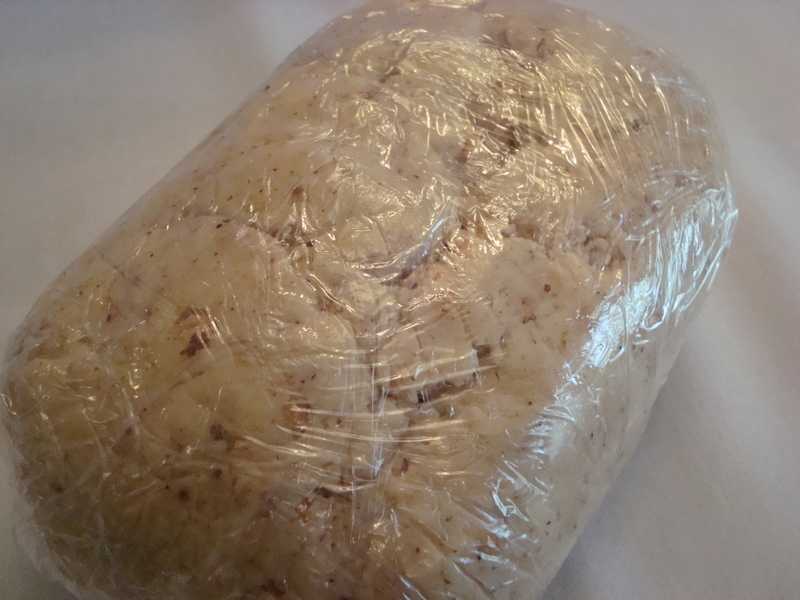 Stir in hazelnuts by hand and wrap the dough in plastic wrap to refrigerate for about 20-30 minutes. 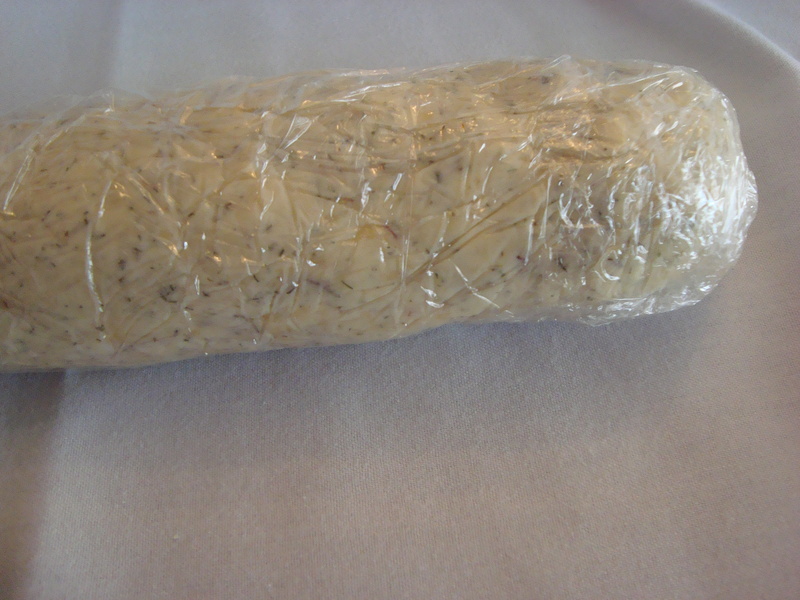 Take out chilled dough and roll out to about 1/4″ or slightly thinner. 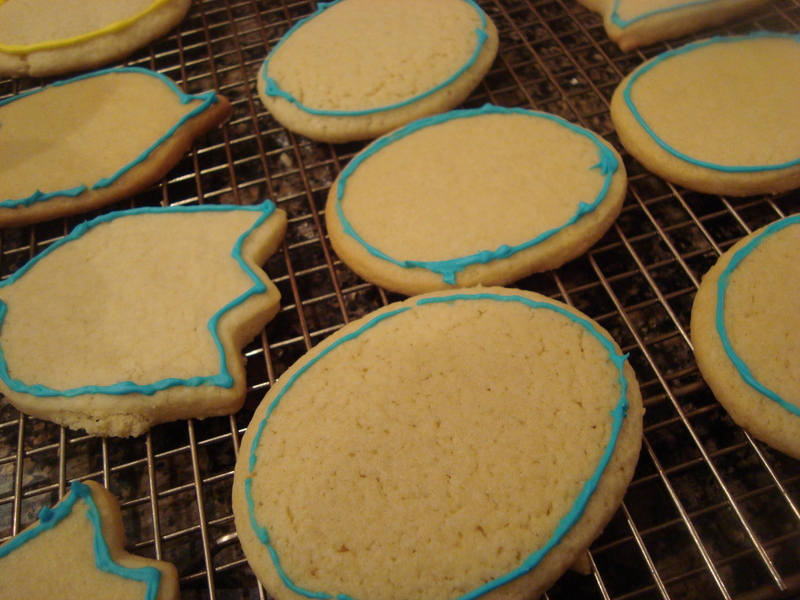 Cut out circles using a 2 inch biscuit or cookie cutter. Bake for about 9 minutes and cool on a cooling rack. 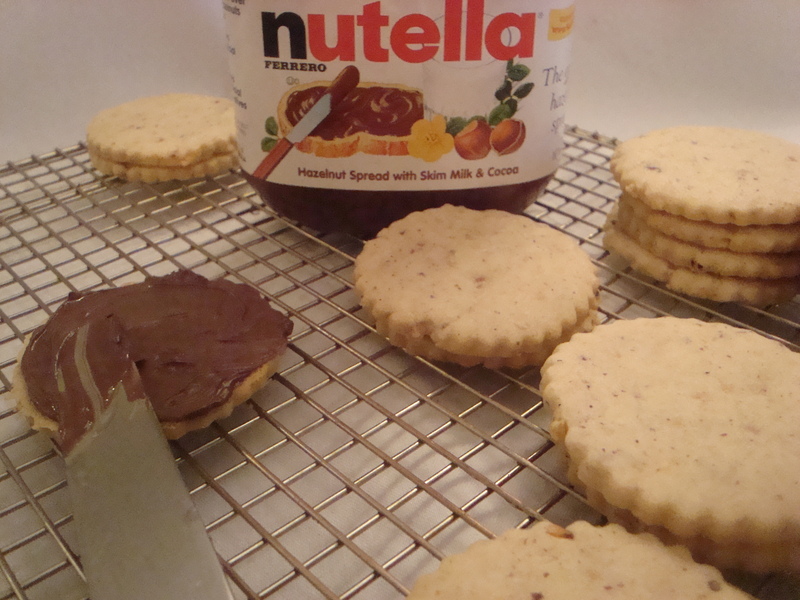 Spread a generous amount (about 1 1/2 to 2 tsp) Nutella on the back of the cookie and place another cookie on top making a little sandwich. When all the cookies are paired up ~ yields about 30. 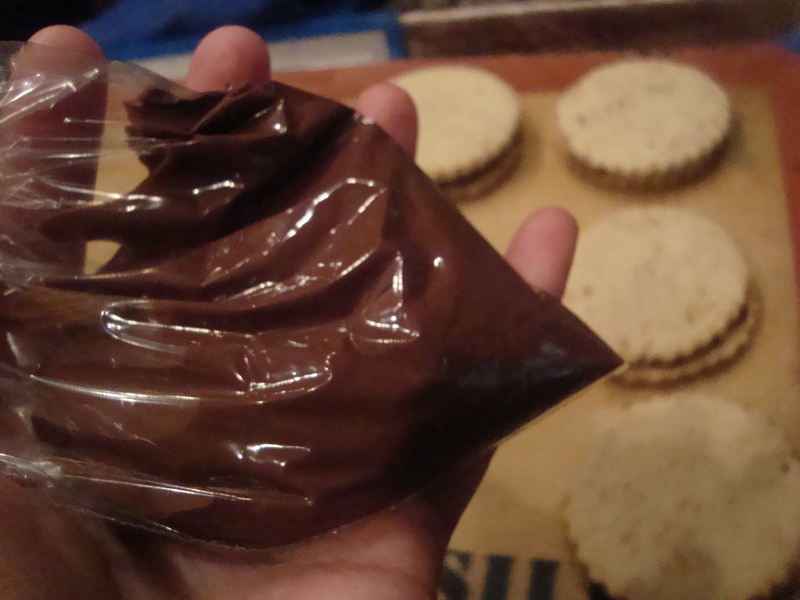 Take about 1/2 cup of nutella and microwave for 25 seconds and place in a small ziplock bag. Cut a corner of the ziplock bag off to create a tip and drizzle warm nutella over each cookie in whatever pattern you choose. Cool in the refrigerator for about 20 minutes and serve. 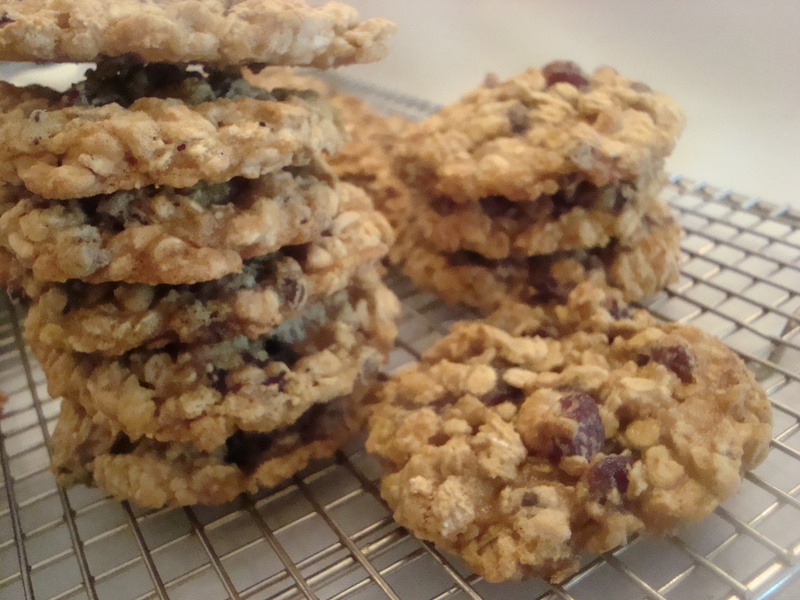 You can store the cookies in an airtight container, make sure to separate layers with wax or parchment paper. Much like the movie “300”, I too had my EPIC cookie “eggstravaganza” (sorry, couldn’t pass that up). 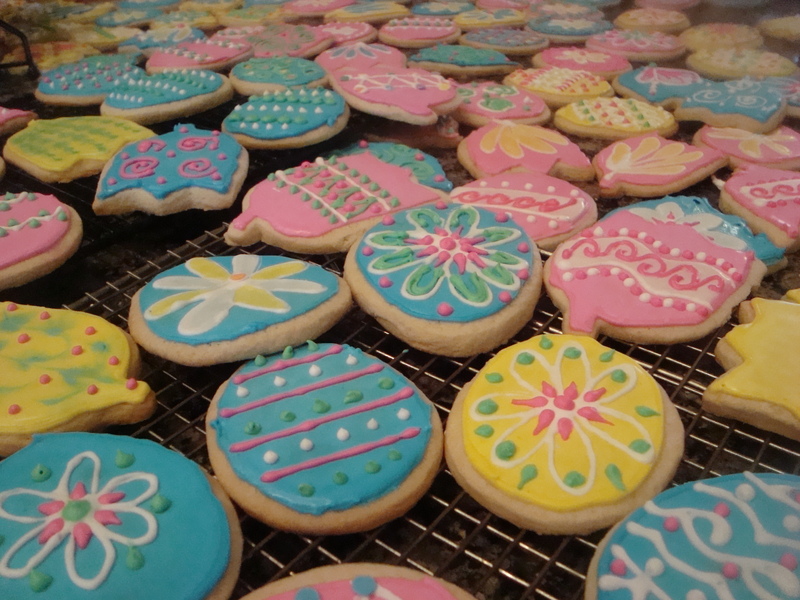 I think mentioned in yesterdays’ post that I thought it’d be great to make 300 sugar cookies and decorate them for Easter Sunday for everyone at church. Let me set this up by saying that I work outside the home, I am also in an Easter Passion Play so all my evenings are full of performances and there are a few other things going on in my life. Not a good time to be baking giant batches of anything. But…. 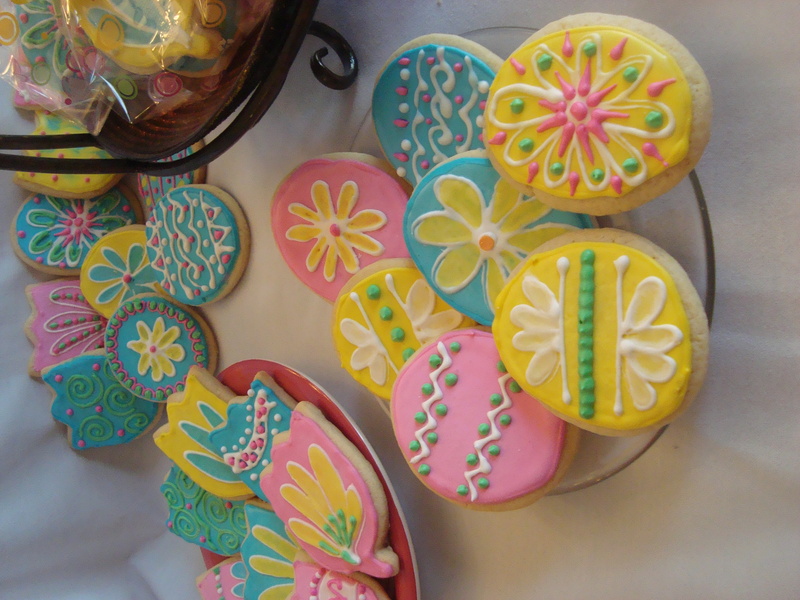 I had visions of stunning cookies decorated with amazing and artistic designs. Oh, did I mention that I’ve not actually decorated sugar cookies before…you know the kind with royal icing that looks gorgeous. I’ve made plenty of sugar cookies and plenty of royal icing (usually when making gingerbread houses at Christmas time) but never put the two together! I thought I’d make some cute little chicks much like one of my favorite bloggers Pasta Princess who posted gorgeous decorated cookies recently (I bow to you Oh great one!). Reality, however can be cruel! My decorating efforts looked more like Angry birds than cute chicks. My Tulips looked like flowers after a hail storm. What was I thinking? I learned a lot though. When you make 300 cookies, by cookie number 200 you begin to figure a few things out, especially at 2 in the morning. Guess what? I also had to make a few extra because some got eaten along the way…. The Sugar cookie recipe is one of my old standbys. It’s delicious and works great. 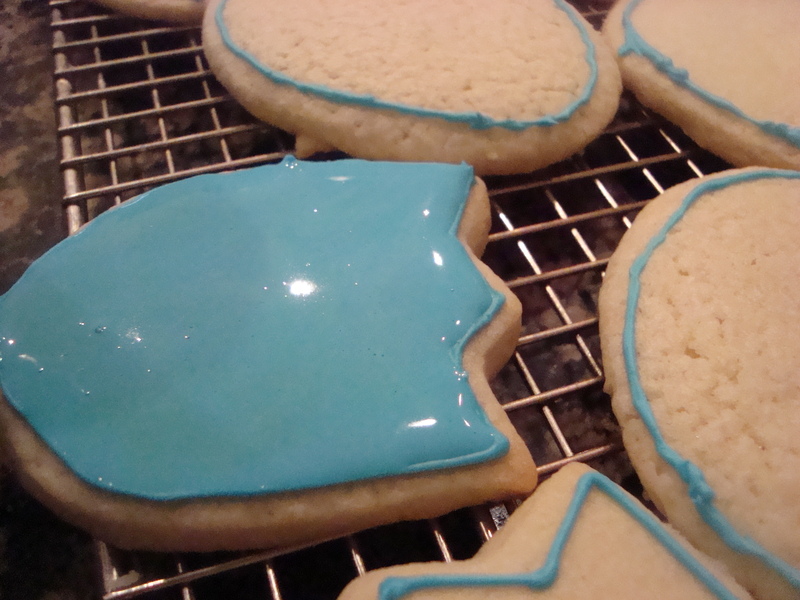 The Royal Icing is also an old recipe that’s been around for a long time and is very versatile. If it’s too stiff, add a little water, if it is too runny add a little more powdered sugar, darn near idiot proof. What I really had to learn was all about decorating. I’m a little embarrassed to post my efforts since they are so amateurish but at least they’re colorful! Happy Easter everyone! 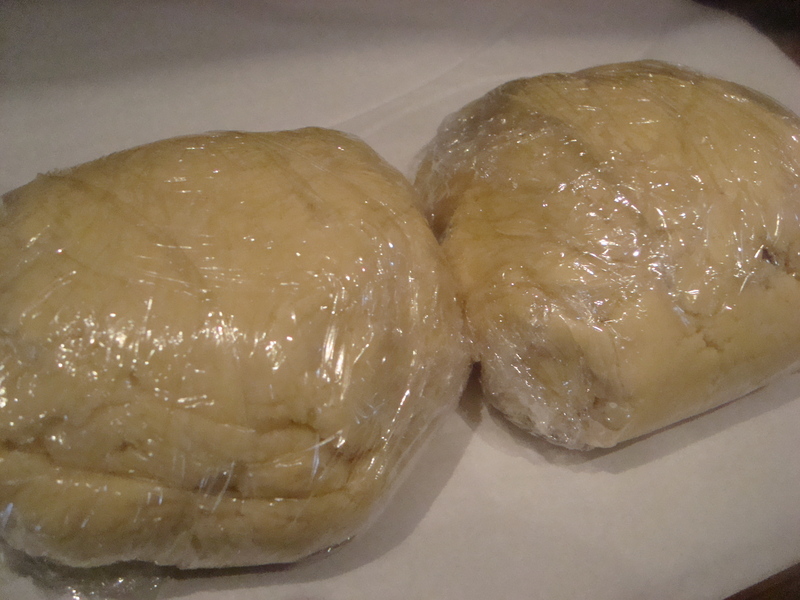 Wrap dough in plastic wrap and refrigerate for at least 30 minutes before use, instead of using flour use powdered sugar to roll out, this keeps the dough from getting tough. 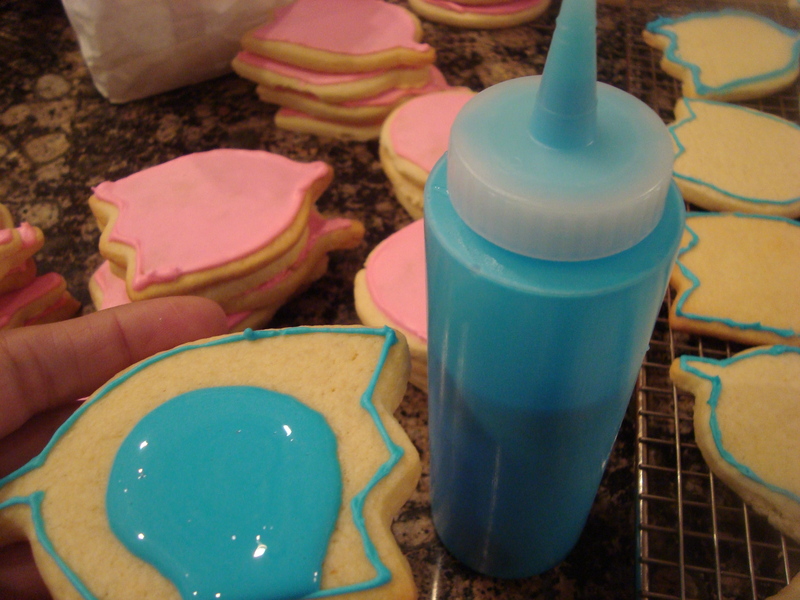 Using a squeeze bottle "flood" the cookie with watered down royal icing, use a toothpick to get to all the corners. Before putting the watered down icing in the squeeze bottle be sure to get all the air bubbles out by letting it sit for a little while, this way you get a smoother surface. I know they are amateur efforts, but at least I know they taste good! 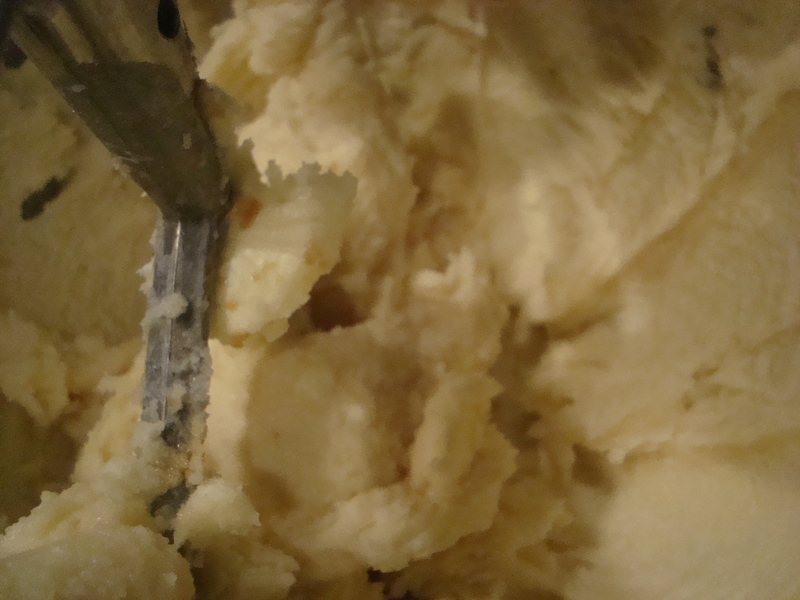 Pre-heat oven to 350o In a large mixing bowl cream butter, sugar and flavorings together. 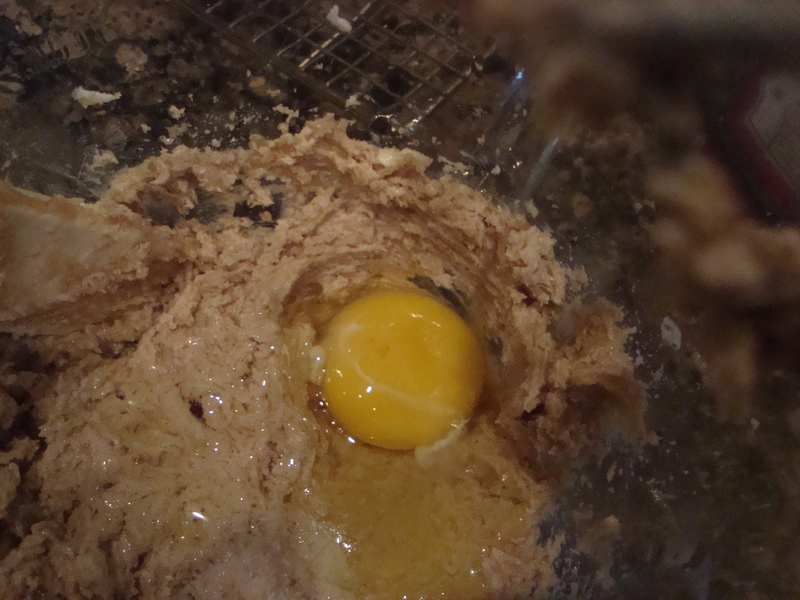 Add in eggs and mix well. 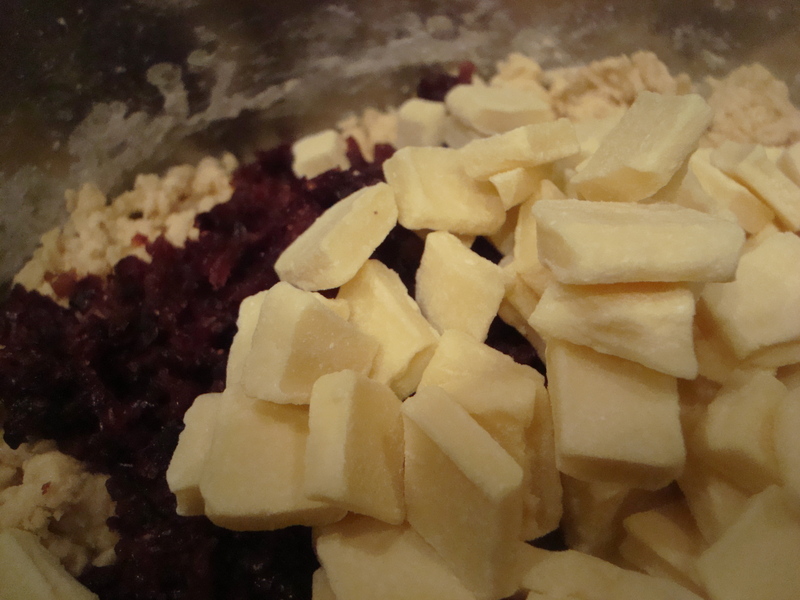 In a separate bowl mix together flour, baking powder and salt. 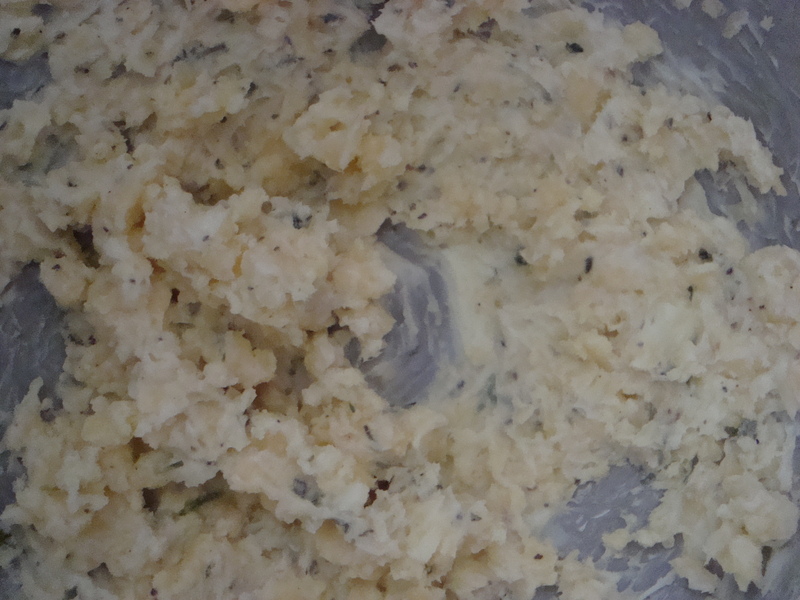 Slowly incorporate dry ingredients into the creamed butter mixture until everything is well incorporated. 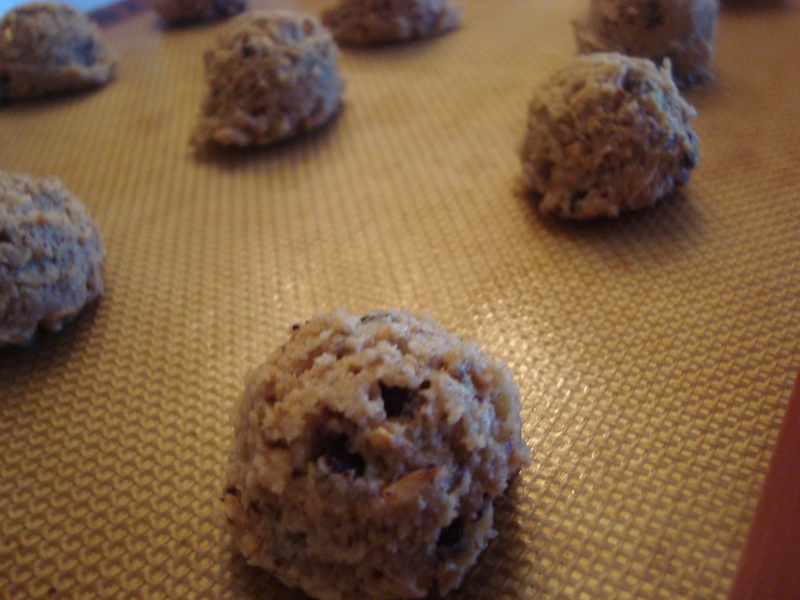 Divide dough into two balls, wrap with plastic wrap and refrigerate for at least 30 minutes before using. This makes the dough easier to roll out. 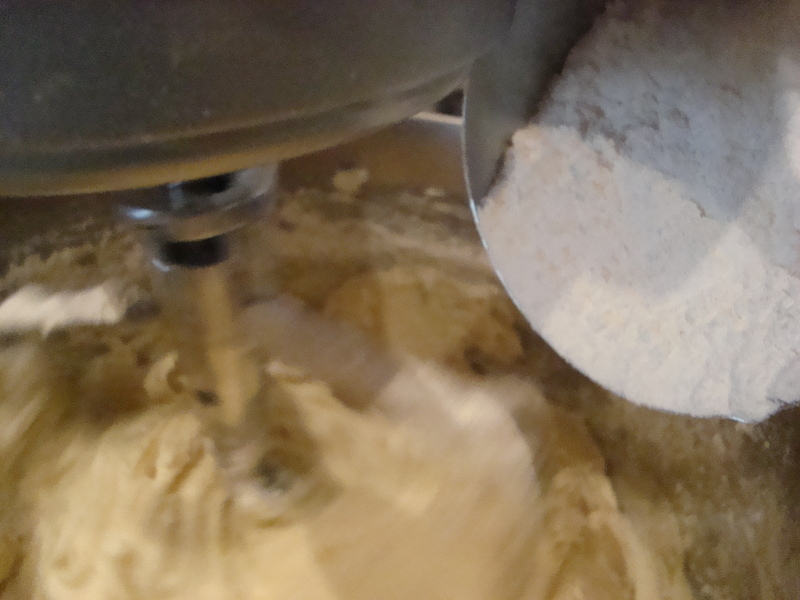 When ready to roll out dough, dust the dough with powdered sugar so it won’t stick to the rolling-pin. 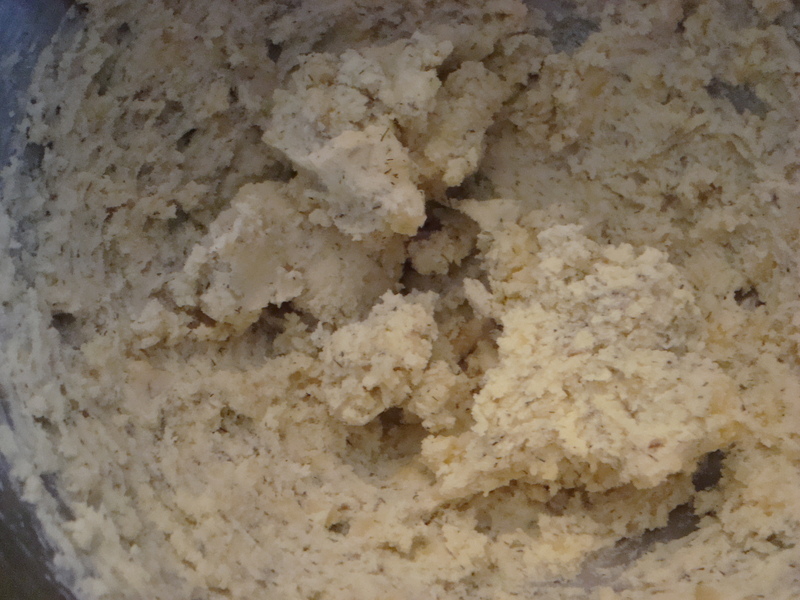 This allows the dough to keep its integrity without adding any more flour. 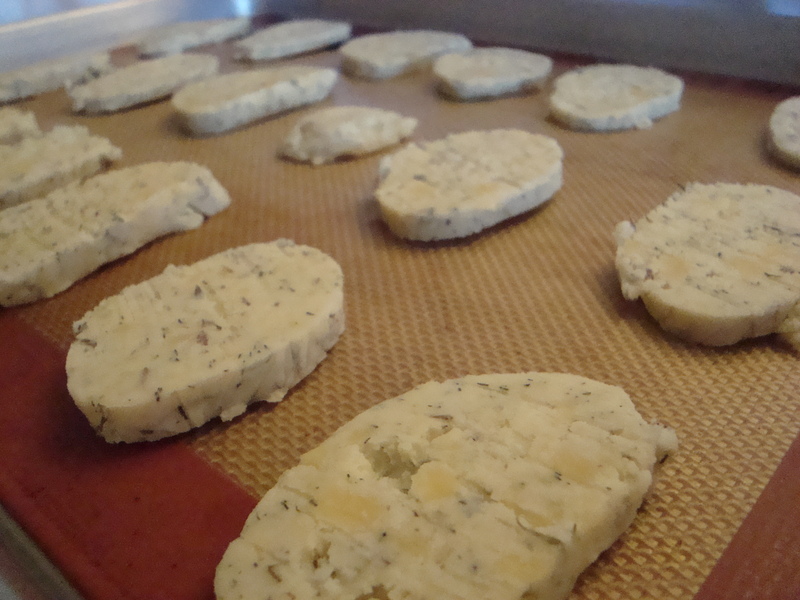 Cut out desired shapes and bake for about 9-12 minutes depending on oven. It should be light golden color, if you want it crisper, bake it the full 12 minutes. 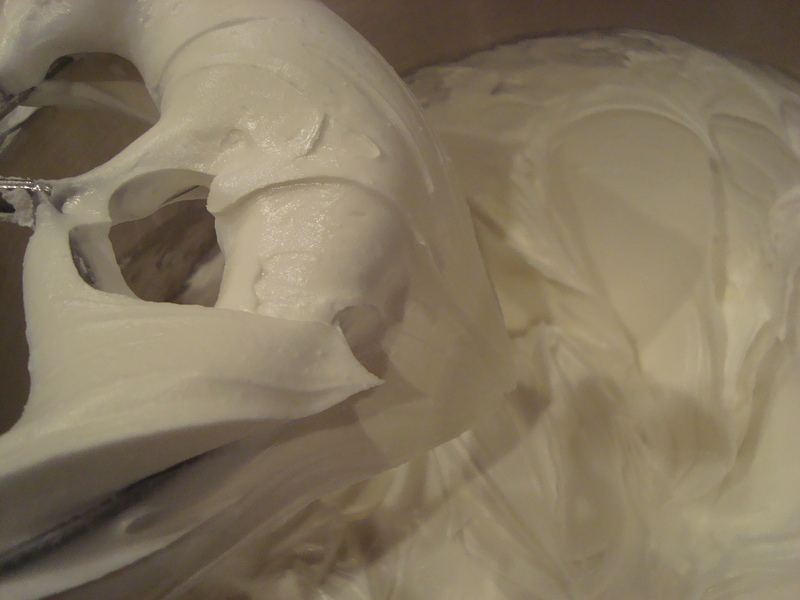 If meringue powder is not available(you can buy them at any bakery or restaurant supply store) then 2 egg whites can be used in its place. 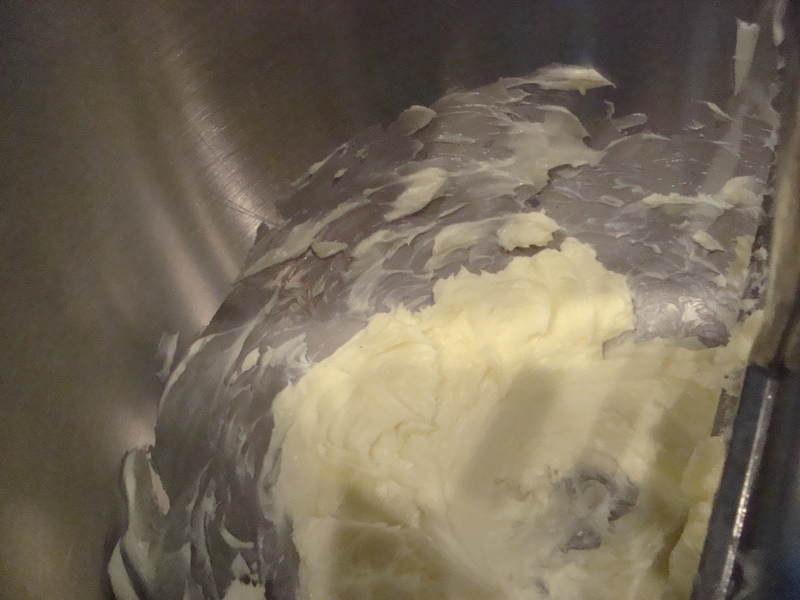 To make sure that it is safe to eat it has to be tempered over a double boiler. 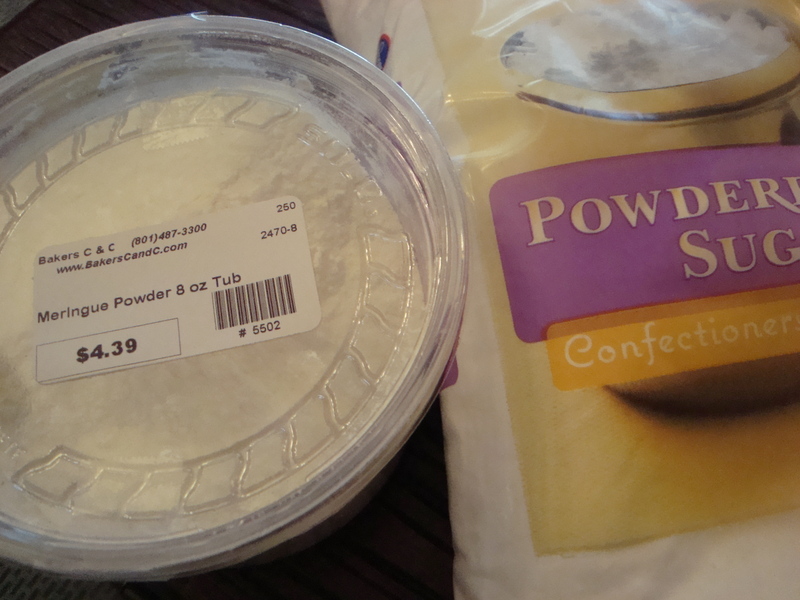 Mix meringue powder and sugar together and add the water. 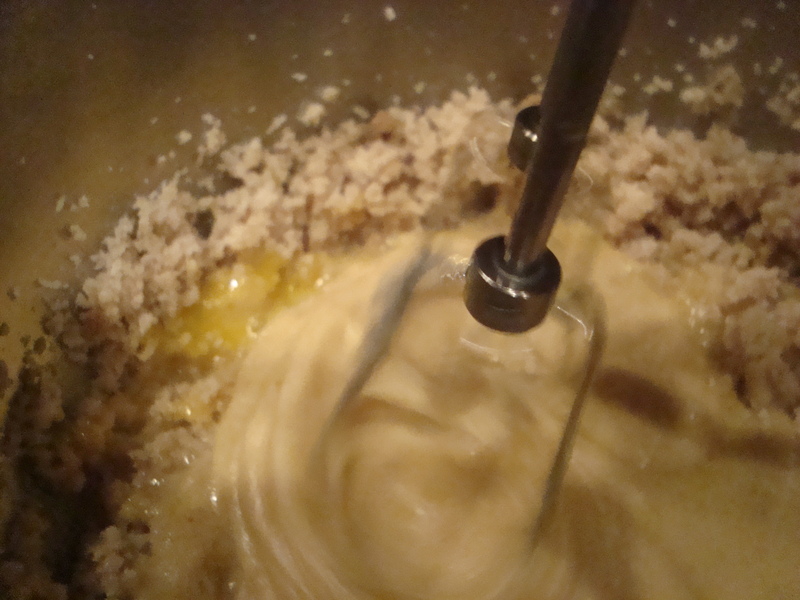 Use an electric mixer on low-speed and mix for 7-10 minutes until icing is nice and glossy and soft peaks form. 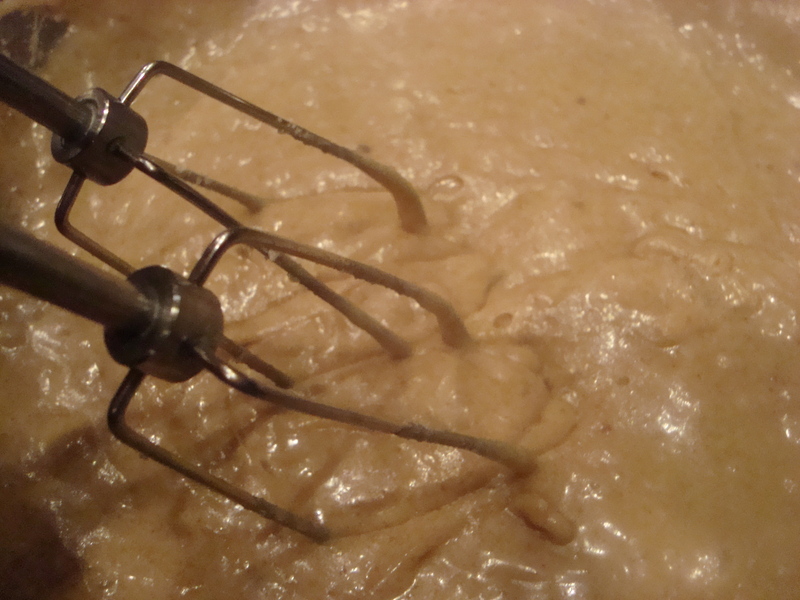 If using a stand mixer, use the paddle attachment and let it mix for about 7-10 minutes. Put it in an air tight container until ready to use. 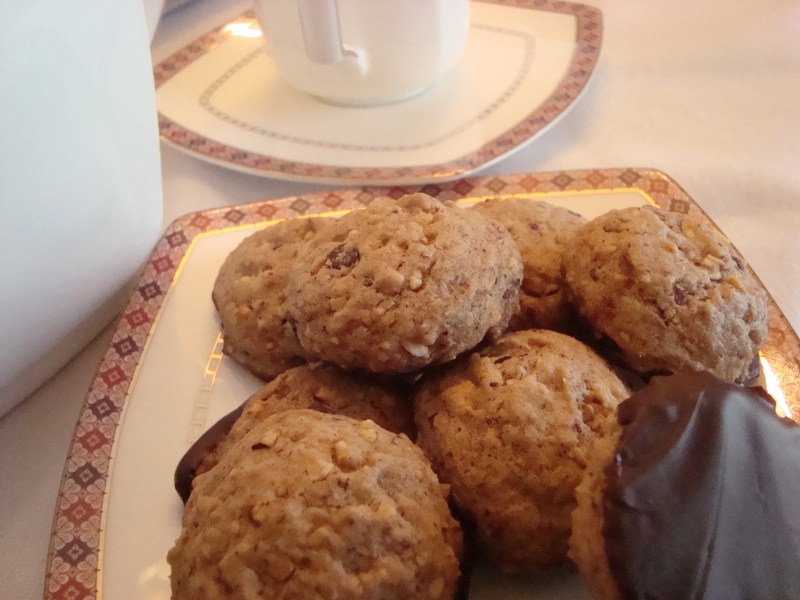 I found a wonderful Hazelnut Tea Cookie recipe in this great food blog called Emmycooks. 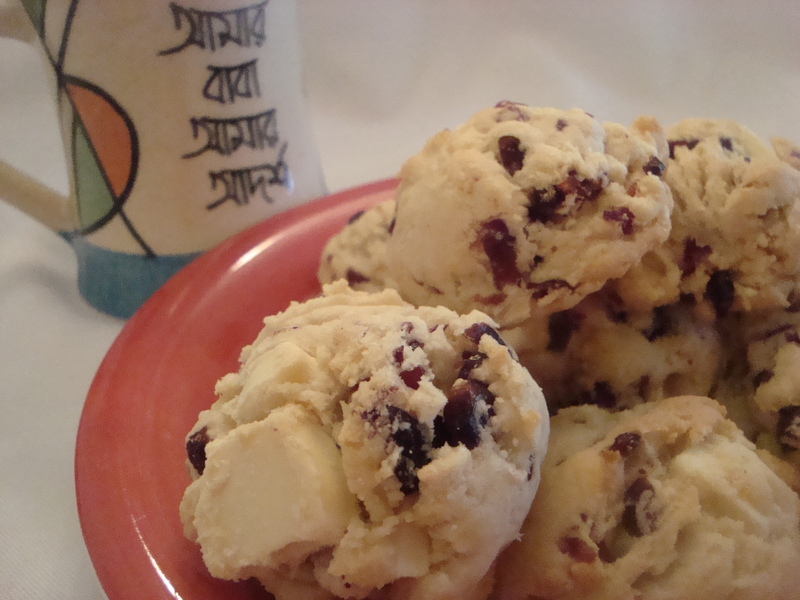 I love a good cookie, especially ones I can eat while sipping a good cup of tea. 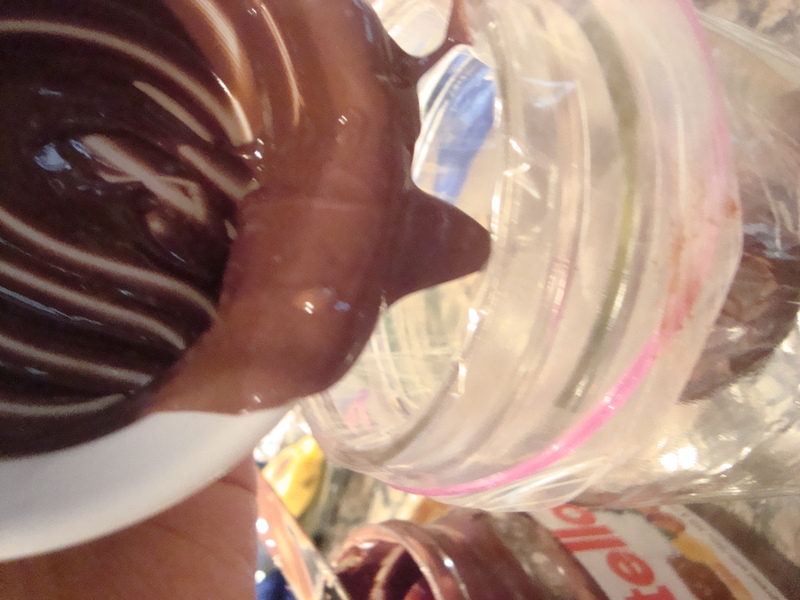 I also really, really, really like Nutella. It’s smooth velvety chocolate and rich hazelnut flavor is to die for. It’s a standard “staple” at our house along with fresh ground peanut butter (so I can make a variety of Thai and Indonesian sauces and put it on my toast too). 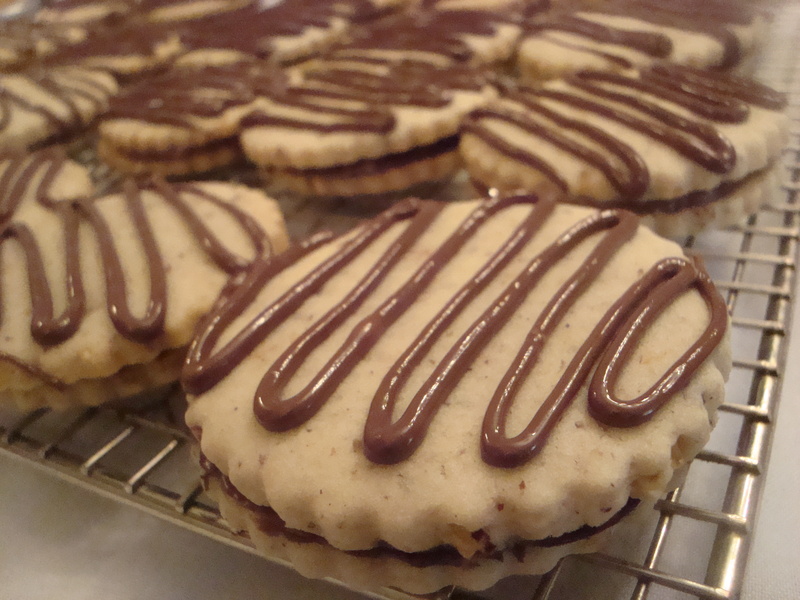 You know what I had to do with this Hazelnut Tea Cookie recipe, I had to “Nutella-fy” it. So now you have a choice, you can make the delightful original recipe from Emmy’s blog or you can also try this version. It’s a win-win. 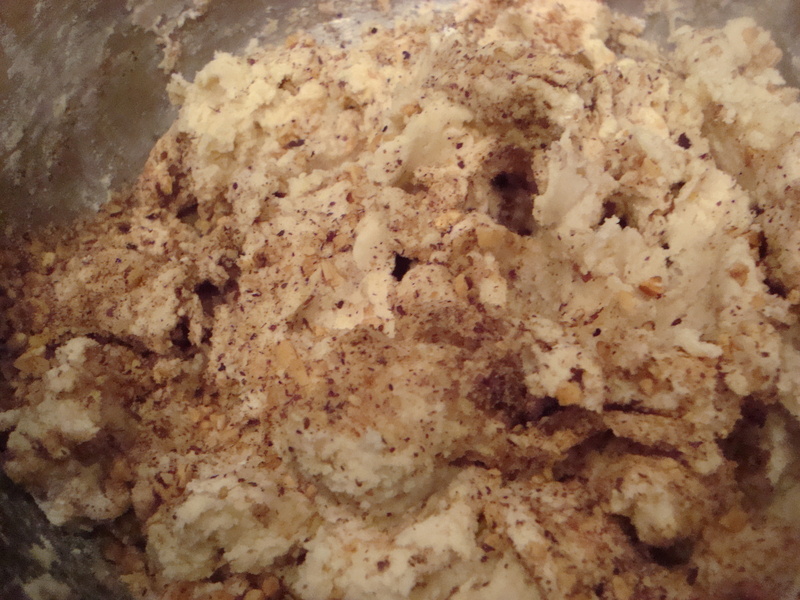 In a food processor finely chop Hazelnuts to yield one cup. Put in a microwave safe plate or dish and microwave for 1-2 minutes stirring every 30 seconds or so until nicely toasted. This intensifies the hazelnut flavor. Cream the butter and the sugar together. Add in egg, salt, soda and incorporate well. Slowly add in the flour and mix well. 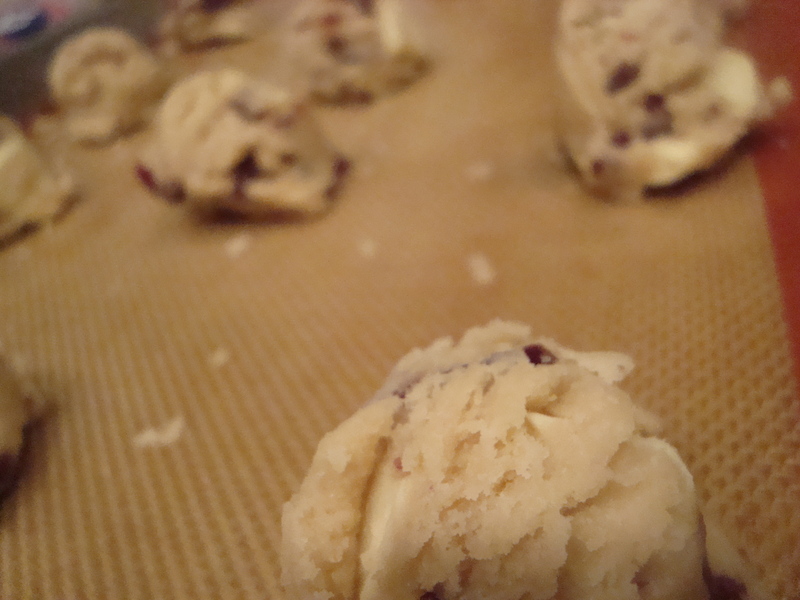 Hand stir in the toasted hazelnuts and mini chocolate chips to the batter and drop by scoopfuls on to a Silpat lined or Parchment lined cookie sheet. Bake for about 8 minutes at 375 degrees. Cool on a cooling rack. 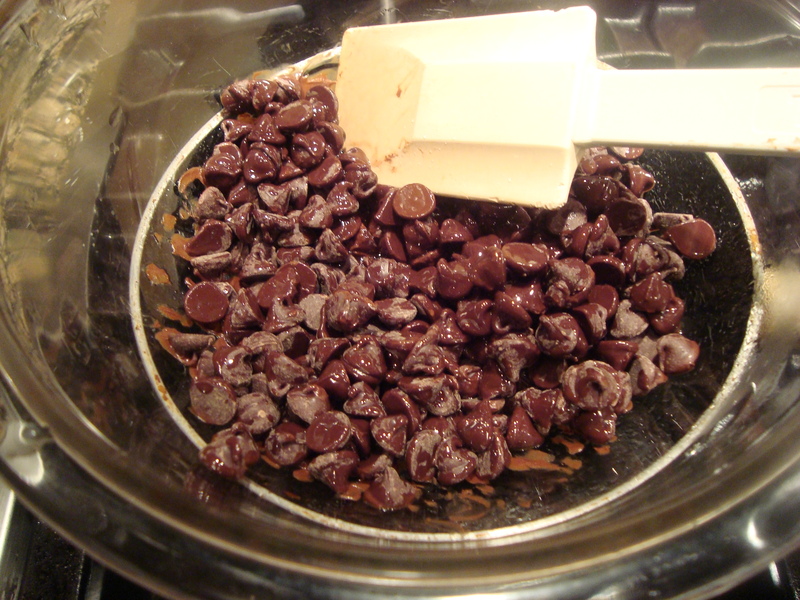 In a heat safe bowl melt semi sweet chocolate chips with the vegetable oil over a double broiler (basically another pan with 1 1/2 inches of water in it that is heated up so the steam melts the chocolate, this is safer for the chocolate so it doesn’t burn, make the sure the bottom of the pan does not touch the water). 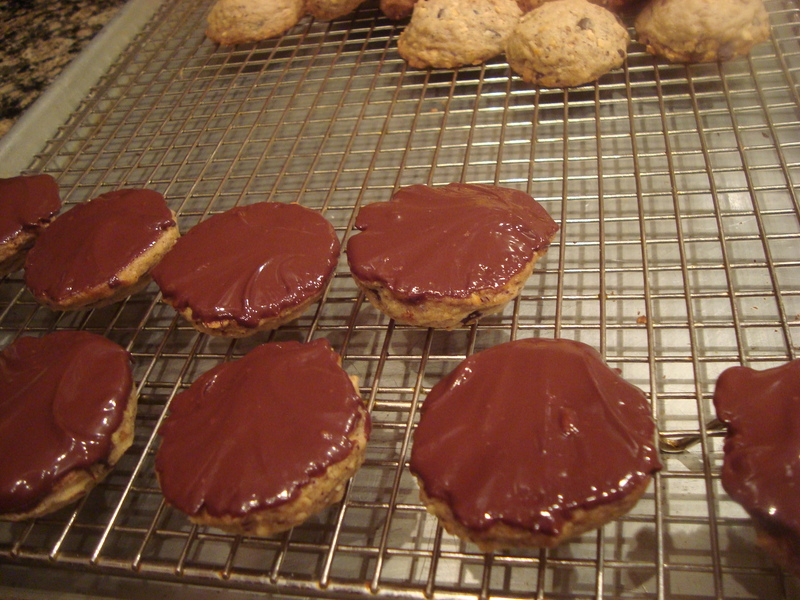 When chocolate is melted place each cookie bottom side down in the chocolate to coat it well. 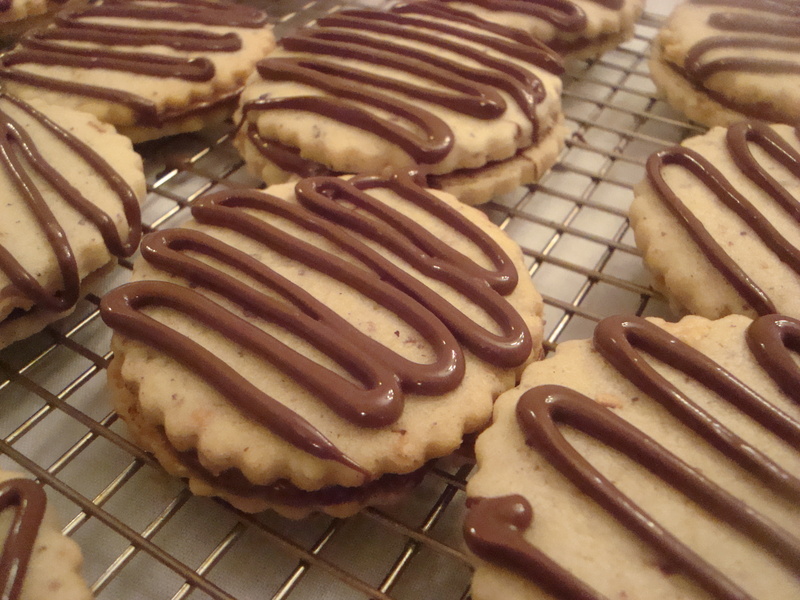 Place the cookie on a cooling rack with the chocolate side up. 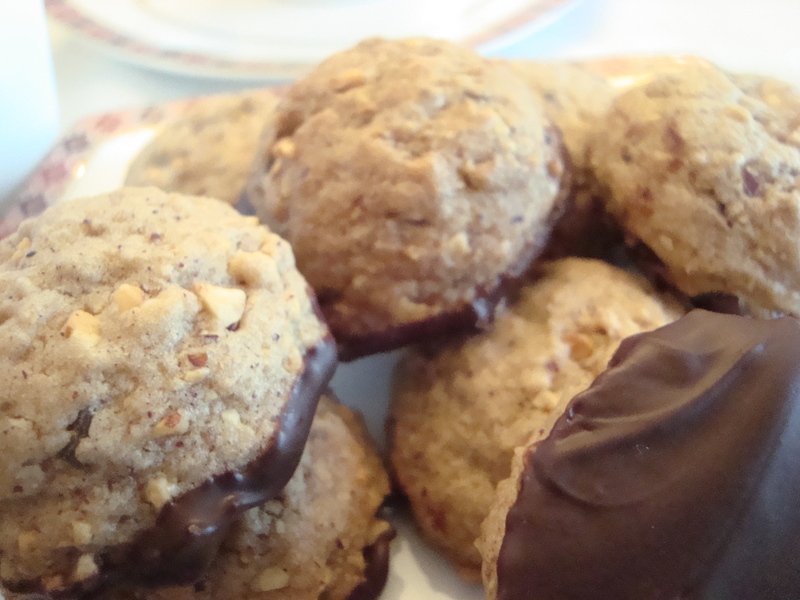 When all the cookies are coated place them in the refrigerator for about 30 minutes for the chocolate to harden. Serve with hot tea or coffee. As a dietitian I get asked all the time about gluten-free recipes and food ideas since so many people it seems, either are diagnosed with Celiac Sprue or have developed wheat or wheat-related allergies. One of the great things about food from different parts of the world, especially South Asia is that a variety of non-wheat based flours are used in cooking. 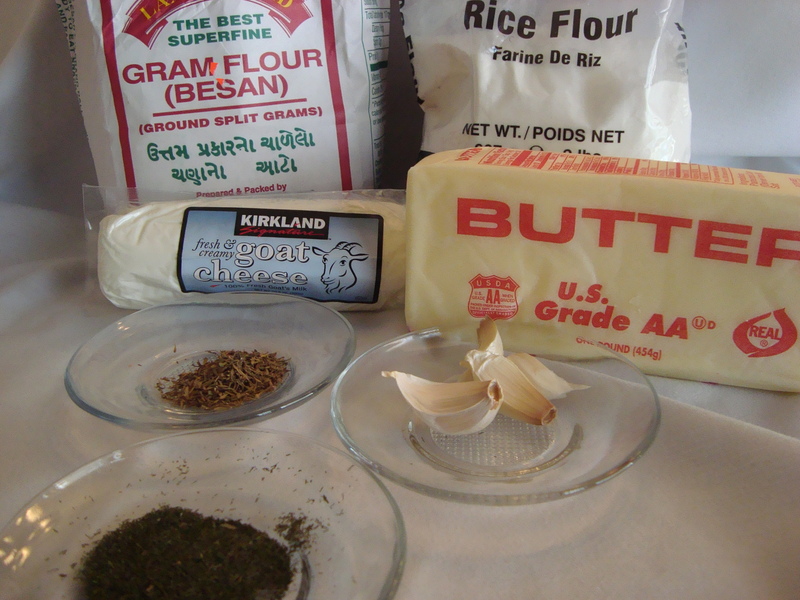 In any Indian, Bengali or Pakistani grocery store you will find “Besan” which is chickpea flour, split gram flour (a type of lentil), rice flours, potato flour and a myriad of other flours. They are routinely used for everyday cooking in a variety of ways. They are much less expensive to buy at an ethnic store than at a “specialty” or “health-food” store. Not only are these delicious but they add a depth of nutritional content that is not found in traditional processed all-purpose wheat flour. One of the complaints I hear about those having to go gluten-free is the lack of breads and crackers that taste delicious. 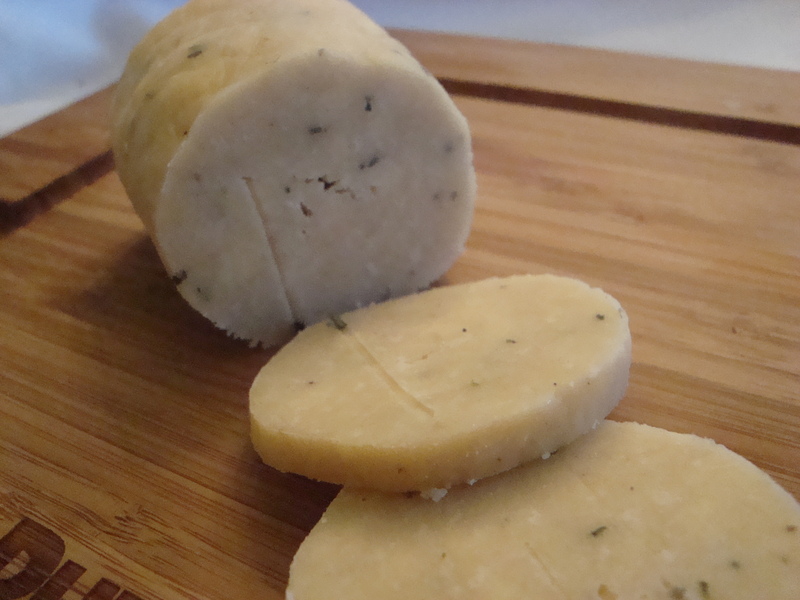 I recently made some homemade Thyme and Rosemary crackers http://kolpona.com/2012/03/21/thyme-and-rosemary-edam-crackers/ and decided that I could make a variation of that using non-wheat flour and the results were truly, truly delicious. The rice flour adds a crunch to these crackers that make them so addictive that I must confess I ate most of the crackers by myself. It was a little embarrassing. I enjoy finding bargains and especially food bargains. Today on my grocery store run, I discovered some Edam cheese on sale for only 75 cents for an 8 ounce package. I couldn’t pass up that deal so I decided to buy a few packages. 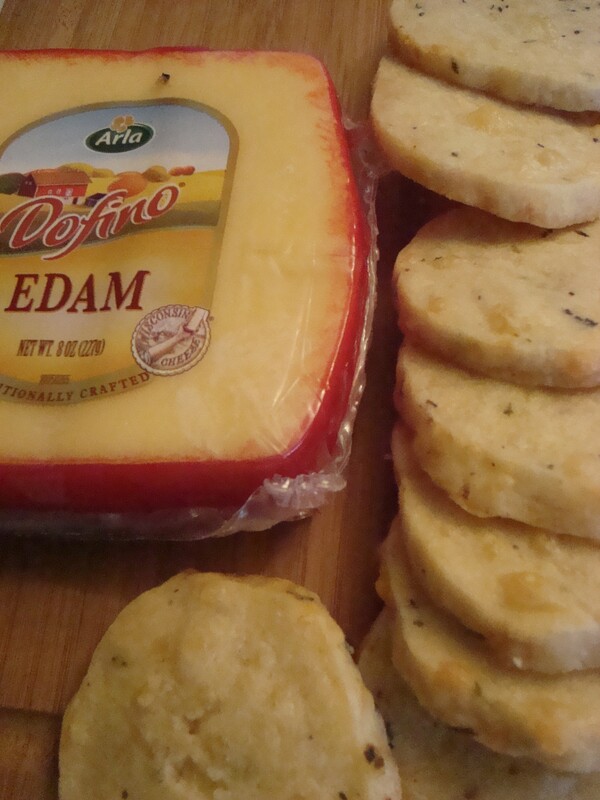 I really enjoy different kinds of cheese but Edam was fairly new to me so I decided to try it out. 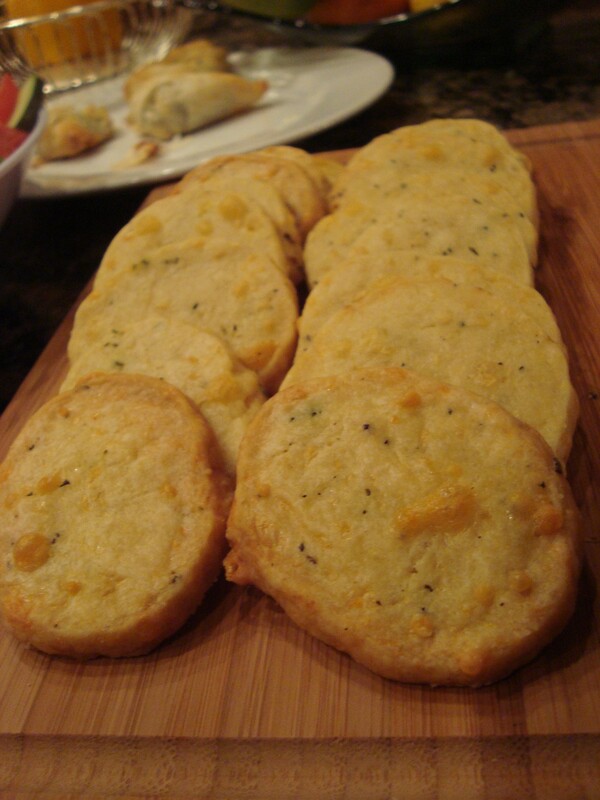 I loved the soft texture and the medium flavor. 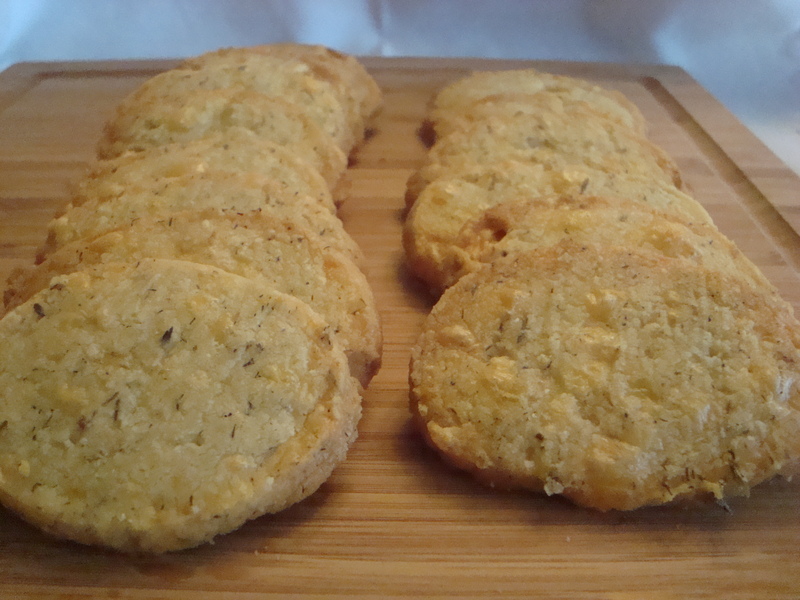 I decided that it would be great to try to make homemade crackers with them. How hard could it be? 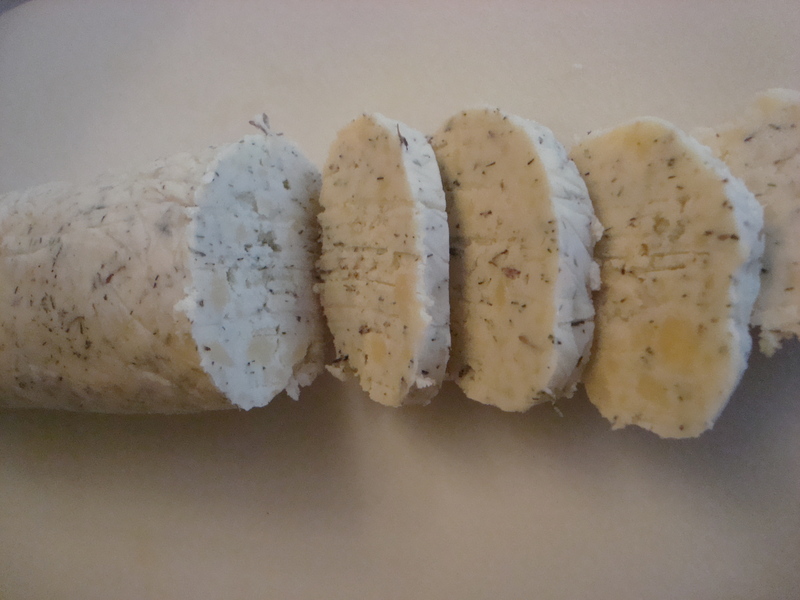 I’d made plain cheese crackers before and thought it would be nice to balance out the flavors of this cheese with some fresh herbs. So, here it is, my little creation. They were fantastic with some fresh salad that had D’Anjou pears in them. It was awesome with some fresh salad. 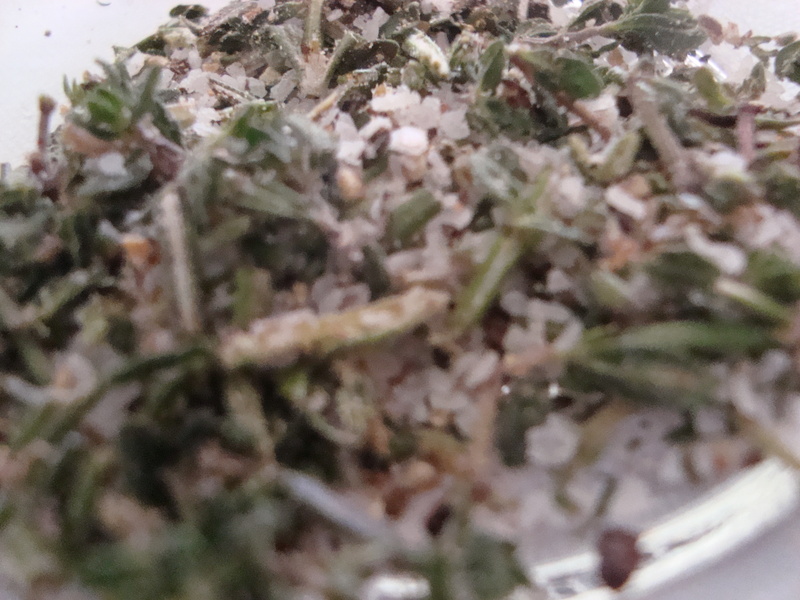 Mix together Rosemary and Thyme with the salt and pepper and rub it together to release the flavors. Set aside. 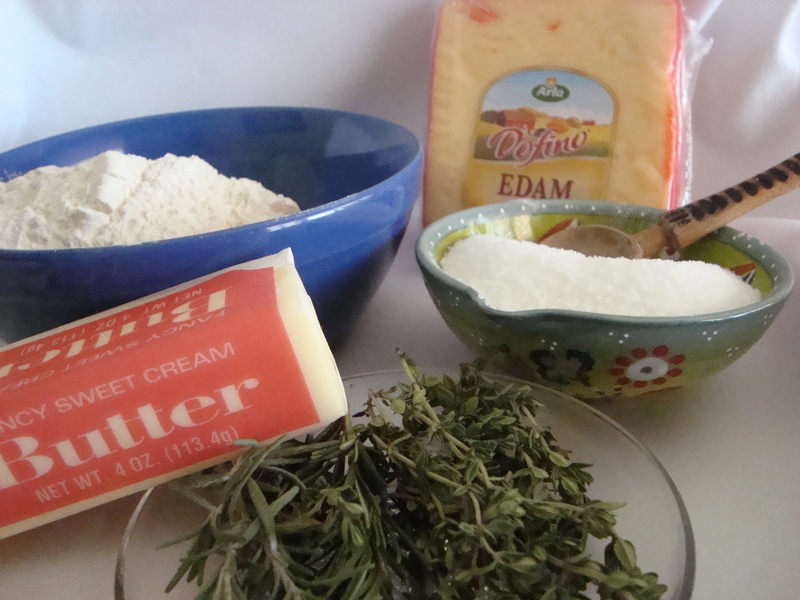 In a mixing bowl cream the butter until smooth and add the cheese and the herb mixture. Slowly add in flour and keep mixing at low speed. 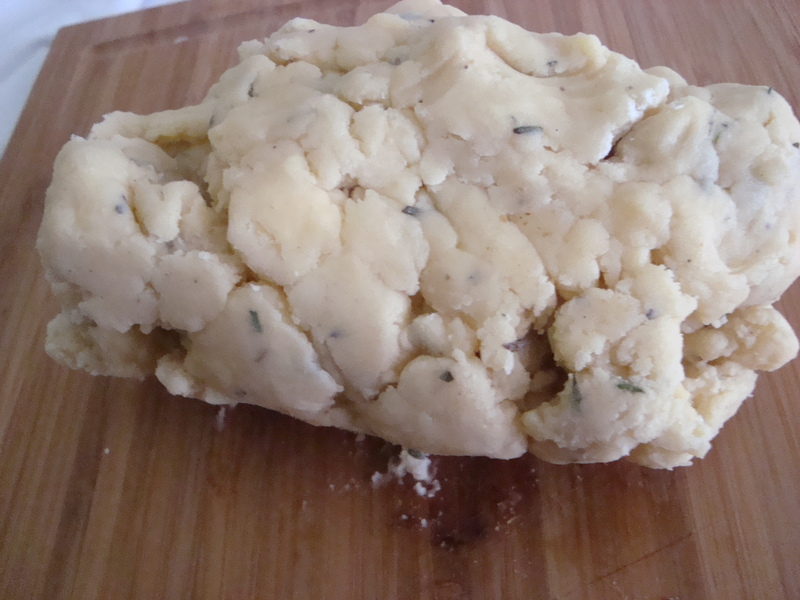 If necessary use the tablespoon of water (may take a little more or less depending on the humidity) to make the dough come together. Take out of the bowl and roll into a 9 inch log. 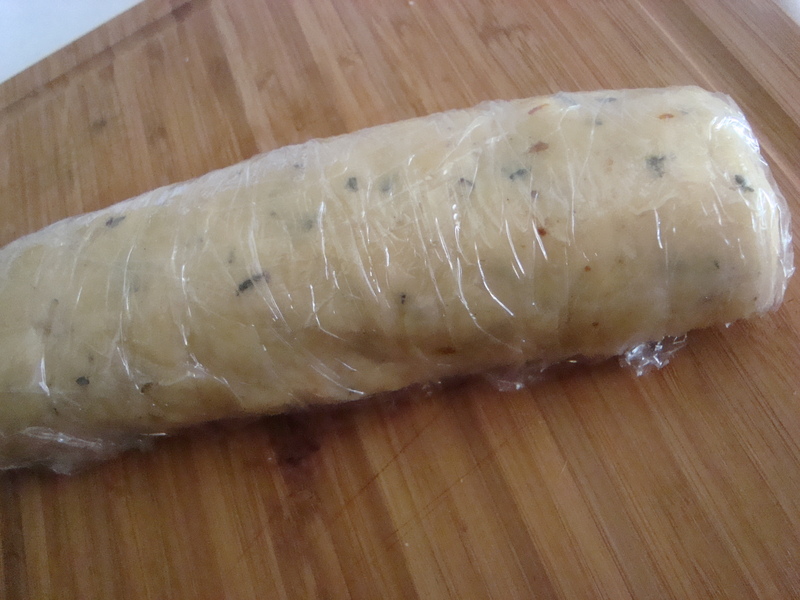 Wrap the log with plastic wrap and refrigerate for at least 30 minutes. 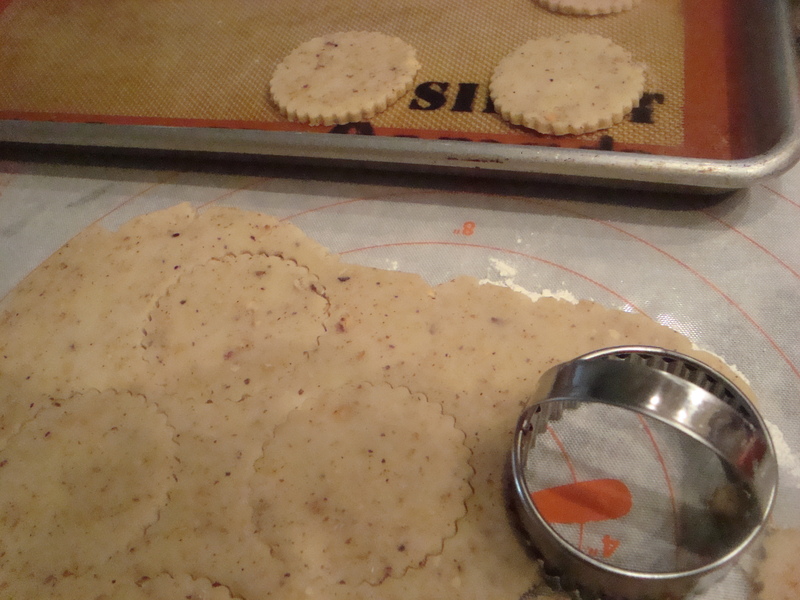 Prepare a cookie sheet with parchment paper or Silpat liner. Using a very sharp knife cut the log into 1/4 or 3/8 inch slices. 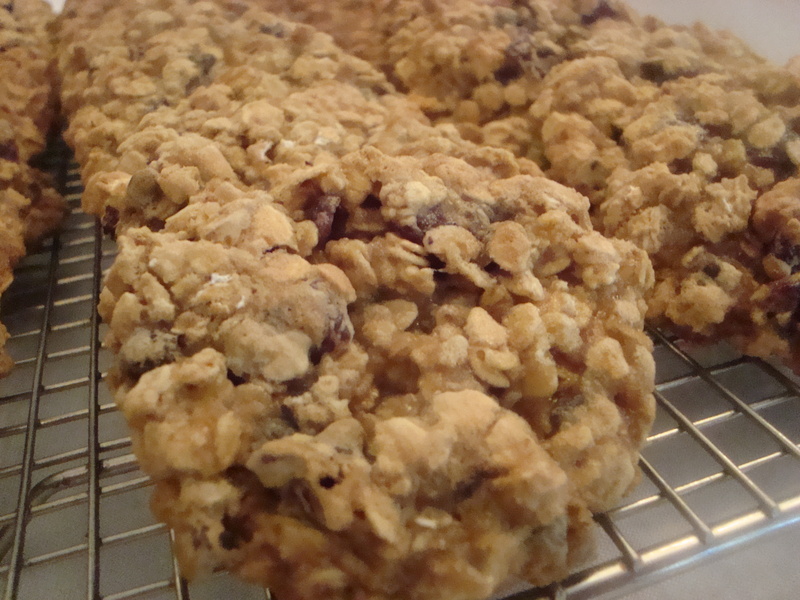 Place on the prepared cookie sheet and bake at 350 degrees for about 20-22 minutes. They should be a beautiful golden brown color. 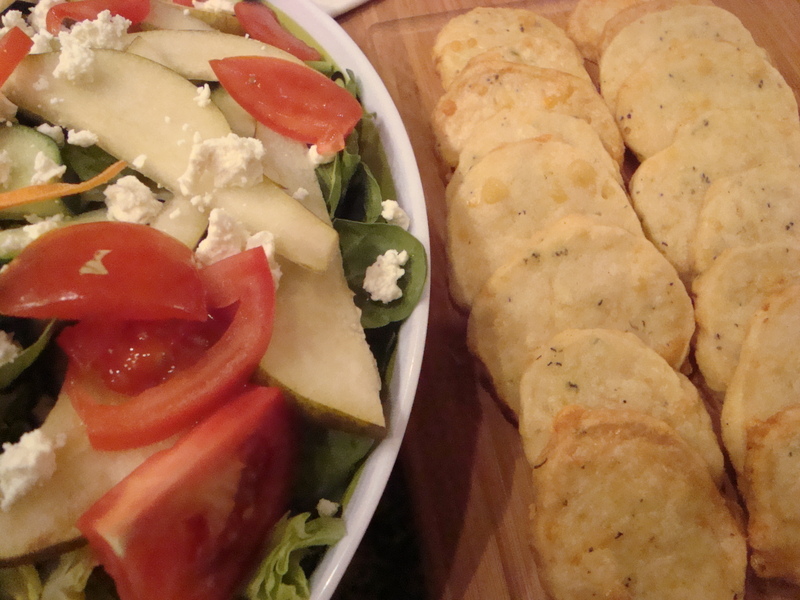 Cool and enjoy as an appetizer or with any kind of salad. They are wonderful with some D’Anjou pears sliced thinly on top as well. Makes about 28 crackers.